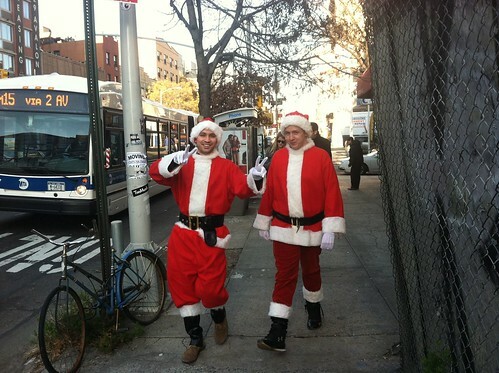 The Day | How Was Your SantaCon? The Local’s Nick DeSantis took the above photo on Saturday. Downtown Traveler, Zoon, EV Grieve, and East Village Corner also got shots of the SantaCon merriment. Composer Phil Kline’s roving holiday boom box orchestra, Unsilent Night, will return on Dec. 17, and guess what? There’s an app for it! According to the Times, participants who don’t have a portable cassette player can now blast the score on their iPhones. According to the WNYC News Blog, the NYC Economic Development Corporation has determined that the East Village boasts the most number of pizza parlors of any neighborhood, with 33. They even have a map to prove it. The Post reports that a Stuyvesant Town resident caught two teens stealing a laptop from his apartment. You might say he caught them red-handed: When he confronted them in the hallway, one of them chomped down on his hand. Ephemeral New York recalls a time when Second Avenue was known as “Yiddish Broadway,” and a building on East Seventh Street housed the Hebrew Actors Union, founded in 1888. According to EV Grieve and Neighborhoodr, Kabin is back open after being shuttered by the health department. Among New York magazine’s “Reasons to Love New York” this year: The survival of St. Mark’s Bookshop.